It seems that 2018 is the year of me just doing things without my typical levels of obsessive over-preparation. I wanted a dressage saddle, so I just bought one without months of painstaking research and saving. (Thanks, Leah! )I had a goal of showing First Level, so I did. I didn’t really train or condition or study or take lessons or plan every detail for weeks on end. I just did the thing. A jumping clinic with newly-minted 4* rider and former classmate of mine Sara Gumbiner sounded awesome, so despite being woefully unprepared for an intense jumping session and waffling over attending until pretty much the week before the clinic, I went anyway. I had jumped my pony probably 6 times this year, still had not gone cross country schooling at all, and would definitely be totally flying by the seat of my pants at this clinic. And to my surprise, despite all that, it went pretty well! It helped that Sara is an absolutely lovely human being, knows me fairly well, and is familiar with Dino. I was surrounded by friends at the clinic – from college, from hunting, and from the lesson barn I rode at in NJ for years. The atmosphere was laid back, and I was honest in telling Sara that I’d focused mostly on dressage this season, and just wanted to have fun and get my sea legs back over fences. It was a recipe for a successful clinic if there ever was one. We started with a very brief warm-up; Sara just sent us out to walk/trot/canter at will and get our horses ready to jump. Dino was unfocused, and while he was being mostly obedient, he was definitely very, very stuck behind my leg. I tried to use the space we were in to my advantage, since the unfenced sand ring was set in the middle of the cross country field, but wasn’t sure exiting the arena to go gallop my pony up and down hills would be appropriate in a clinic situation. I decided to let the first few fences help rev his engine instead. We started with a line of crossrails, and were instructed to ride it the first time through in whatever number of strides our horses found naturally. Dino trotted in for five strides, the other pony in our lesson did five, and the hot little Morgan jumped it handily in four. Sara zeroed in on how stuck Dino was right away, and instead of adding or taking out strides in each subsequent trip through the line, she had me focus on just riding aggressively forward and straight, making good turns in the corners, and opening up Dino’s step to get the four strides reliably. While we were definitely on the struggle bus as far as impulsion that day, eventually we nailed the four. The fences went up to 2’3 verticals after a few passes, and after we’d all jumped through the bigger line in the appropriate number of strides for each horse, it was time for course work. Sara had us build on what we’d already done, starting with the outside line in four, then adding two single diagonal verticals and an outside triple (three to three) in various combinations. Our first attempt was… rough. Dino was still pretty behind the leg despite my attempt at riding him out of the ring onto the grass before we started the course, so our first line was completed in an awkward five instead of a flowing four. 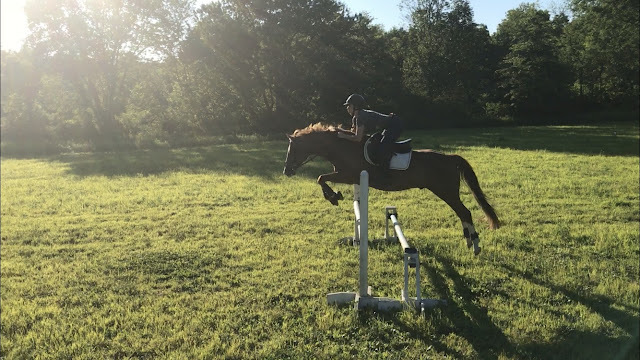 After that the internal screaming started in my brain, and I just kind of aimed my pony at fences with no real plan, not enough leg, and some really ugly turns. We got around, but just barely. Dino was being a REALLY good boy putting up with my lack of leadership during that first course! One of the things I loved about riding with Sara was how perceptive she is. Right away, she saw how Dino and I can spiral downward into a cycle of refusals and lost confidence even though we’d jumped every fence put in front of us thus far. She stressed the absolutely vital importance of getting him in front of my leg in a rhythmic canter before we even think about jumping, as well as making better turns to the fences so that our approach was straight. Sara also totally called me out on my habit of backing off when I felt Dino back off of the fences on course that he hadn’t seen yet. She advised me to sit back behind him and keep my leg on – he’d back off without my help so I needed to stay committed to the fences! When I went to begin our second course, Dino responded with a whole lot of pony’tude. It had been a long, long time since he was in a group lesson, and the whole “wait your turn and then go back to work” thing was NOT working for him. I made the decision not to approach the first line when I struggled to get my pony to pick up the canter, and Sara told me to leave the ring and go gallop. Dino immediately perked up as I pointed him into the wild blue yonder, although he was a little surprised at this change in scenery! He spooked at the cross country jumps and the divots in the ground and the photographer, and then settled in and just went forward. Finally! Once the go button was working well again, I stayed in that great, forward gallop and headed back into the ring towards the first fence. I took a much better #bossmareup attitude into this second course, and rode hard and forward to every jump. Dino met me in the middle with a really good, balanced, energized canter and we rocked around the course in fine style. If this had been a regular lesson, I would have made the decision to quit there, but this was a clinic, so we had more jumping to do! Sara had us head out into the field to add in some cross country jumps, creating a derby-style course that moved from the field back into the ring. She schooled the one rider in our group who had never jumped XC before first, and then it was our turn. We were to ride up and down the little ramp, over a log pile, make a u-turn over a small log, back over the log pile the other way, then back into the ring to finish with the course of stadium jumps. This is where my brain short-circuited. I didn't get Dino galloping forward before we rode over the ramp, and that was mistake #1. But the log pile was small, and I figured we could just trot it if we needed to, and everything would be okay. Dino picked up a nice canter on the downward side of the ramp, though, and we headed towards the log pile. If I had just kept my leg on and continued riding forward, we would have jumped it, but as we approached the jump, that old familiar heart-pounding feeling of absolute blind panic and terror leapt up in me, and I pulled the reins and made my pony stop. Head spinning, heart racing, breathing hard and trying not to lose it, I apologized to Sara for my weirdness. She had me re-approach the log pile, but I just couldn't make myself commit to it. The fear was there and it was taking over. This is also where Sara really showed her skill as a trainer of amateur riders. 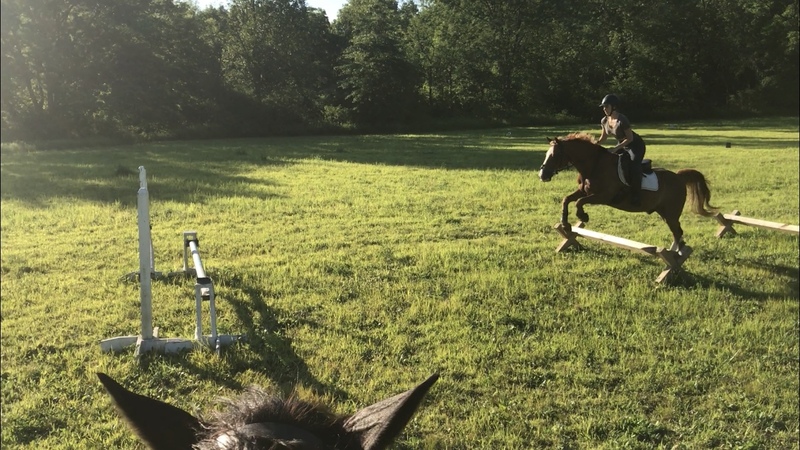 She never got upset or frustrated with me, and instead had me move on from that jump and work on popping over a little, teeny log from the sitting trot. We did it over and over again until both Dino and I were negotiating it with confidence, focusing on me staying way behind my pony in a safety seat until we were both on the other side of the jump. She then had me head back into the ring to complete the stadium course, but by this point my body was exhausted and my brain was a little fried, and I had some panicky moments and made some poor turns that lead to a couple stops there, too. Sara, though, never got flustered and helped me slow my thinking down as she directed me to just canter Dino forward around the ring, around and around until we got forward installed again. She effectively broke the Stop Spiral and got us both back on the same page, making the jumps in the line and combination smaller and more inviting for my brain while we cantered around the outside. Once we were ready, Sara had us come back through the outside line again several times until that was going well, and then had us finish the course. It wasn't pretty, but we did it, and we ended on a good note. While I was disappointed that the lesson ended up devolving from what was a great beginning, I was REALLY pleased that I recovered from an anxiety attack and was able to change the course of the ride with Sara's kind and expert help. As far as my impressions of the clinic overall, I would absolutely ride with Sara Gumbiner again! She is knowledgable, kind, patient, and perceptive. She was able to give each rider what they needed in the lessons, and skillfully guided everyone to improved performances, no matter what their particular difficulties were. While she was insistent upon everyone making a good effort and riding to the best of their ability, she was incredibly tactful, compassionate, and helpful to me when I nearly had a meltdown in my lesson. As an amateur with lots of baggage and fear issues surrounding jumping, this was HUGE for me. Sara had a lot of tools for every situation that presented itself in the clinic, and I so appreciated her instruction. If you ever find yourself in eastern PA and have the chance to ride with Sara, DO IT! wow that sounds like a great clinic! and good for you for getting over the bad and finishing on a great note. Great job!! AND yay DINO jumping :) love the photos but understand when the cost is so much!! What a good clinic! And the pics of you two from the link are super adorable! Sounds like a fantastic clinic! Nice job. I so identify with random panic attacks that can derail a lesson. I really liked photo 32, and there are a couple of candids of you two. Too bad they were so pricey. Sara sounds amazing! She really seems to understand fear, which is a huge thing for a trainer. A lot of them don't because they've never really felt it. Sounds like a fantastic lesson, even if it wasn't all shiny and smooth. You learned a lot, and you kicked fear in the face. oooh what a fun day - good for you for just getting out there and doing it!! i'm a dyed in the wool planner, but lately am also trying to embrace a little more light hearted impulsiveness in my approach to horses. sometimes it's just what we need! also i love all the pro photos - esp bc you're smiling in so many of them!! The right instructor can change your WHOLE perspective and do it without shaming. This lady sounds awesome! And SO impressed with you and Dino for refocusing and ending on a good note. Lessons like these are all building blocks - and these were some good ones! It sounds like you had an INCREDIBLE clinic! Well done!! I love how clued into your style the clinician was immediately and was able to set y'all up for success.